The Lewiston growers say they started growing marijuana because they couldn't afford to buy it. LEWISTON — In a bedroom of her Healy Terrace apartment, 65-year-old Susan Deschene created an elaborate growing room for three carefully cultivated marijuana plants in containers filled with ground-up coconut husks. For the pain-racked family and child counselor — who uses a wheelchair and whose health has kept her from working for a decade — the plants offer the hope of better sleep, fewer aches and more money. The problem is that even though she’s a card-carrying medical marijuana patient living in a state that’s made marijuana use legal for everyone, she’s getting evicted for having the plants in her $700-a-month apartment. Despite a federal law that makes marijuana possession, use or cultivation a criminal offense, it isn’t a necessity that tenants in federally subsidized properties such as Healy Terrace steer clear of the drug. Though known users are supposed to be turned away before renting, property owners can decide whether existing tenants with marijuana can stay or if they must go, said Rhonda Siciliano, a federal Department of Housing and Urban Development spokeswoman in Boston. “We leave it to them to decide,” Siciliano said. A 2014 memorandum by HUD details the policy. Marissa Severance, manager of the historic Ash Street apartment building which has about 32 units for those 55 or older, could not be reached for comment Tuesday or Wednesday. Deschene’s landlord, Preservation Management, notified her in mid-September that it was ousting her for breaching her lease by “cultivating an illegal substance” discovered during an Aug. 23 inspection of the property. The landlord plans to bring an eviction case to the Lewiston District Court after Oct. 1 to force Deschene and her caretaker son, Phil, to leave their second-floor unit. Even putting aside their possible eviction, Susan and Phil Deschene are in a tough position. 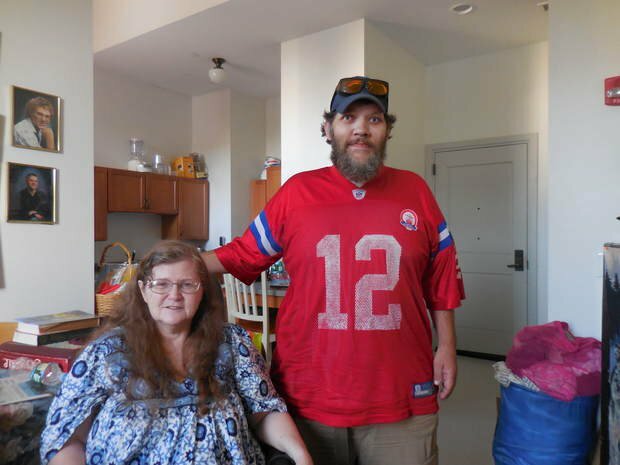 Phil Deschene, 42, moved back to Maine a decade ago to help take care of his mother, who has a neurological disease, a spinal injury, post-traumatic stress disorder and other ailments, and eventually had to use a wheelchair. Less than two years ago, though, his ability to lend a hand took a terrible blow when doctors discovered he had a tumor the size of a baseball behind his eyes, filling his nasal cavity and causing his pituitary gland to send out faulty hormone levels that caused his body to swell. The operation that removed much of the tumor left him almost completely blind. He is still receiving medical treatment to try to beat back the cancer, but has painful difficulties with most his organs. His mother cried as she described his ongoing woes. “There are days he’s in such pain, he can’t do anything,” she said. Both mother and son are considered totally disabled by the federal government. Including some money from a military pension, they receive about $2,200 monthly to get by — enough to cover their rent, food, medicine and little more. There’s nothing left over. They wouldn’t even have housing, she said, except that U.S. Sen. Susan Collins’ office provided some help finding the apartment in July 2016. Where the marijuana comes in, both tenants said, is that it helps them relieve the pain and makes it possible for them to get by with fewer prescription drugs. “We started growing because we couldn’t afford to buy all the different medications,” said Phil Deschene, who is also eligible for medical marijuana. He said he figured out that the $100 it costs him to grow a plant — each one harvested lasts him four months — saves more him more than $300 monthly in drug costs while offering more overall aid. His mother would save money, too. They each said that the marijuana plants they are raising, which should be ready to harvest by the holidays, offer them a shot at being able to save a bit, making it possible that in a year or two, they might be able to cobble together enough money to purchase a small home. “Without growing, we can’t change our economic situation,” Susan Deschene said. If she’s cast out, she said, she’s worried she’ll wind up in a nursing home, where prescription drugs alone won’t be enough for her pain. Because edibles made from marijuana help her sleep, she’s also concerned that her overall health would quickly deteriorate further if she couldn’t get them. Phil Deschene, who smokes marijuana on a bench outside to avoid problems inside the building, said he is “not trying to build an empire,” he just wants to help his mother. Susan Deschene said she tries not to be a burden, despite facing obstacle after obstacle. “We just do the best we can to take care of each other,” Phil Deschene said.